The look and feel of the workshops were familiar and traditional. These days, a BeeBot educational robot, a Scratch programming app, Makey Makey electronics or a Lego WeDo robot set are hardly surprising anymore. However, these tools offer both excitement, brain racking and a sense of accomplishment for beginner programmers or first-time robot builders. The primary focus of the workshops was to introduce programming in fun and straightforward way and to show that it is suitable for both children and adults. 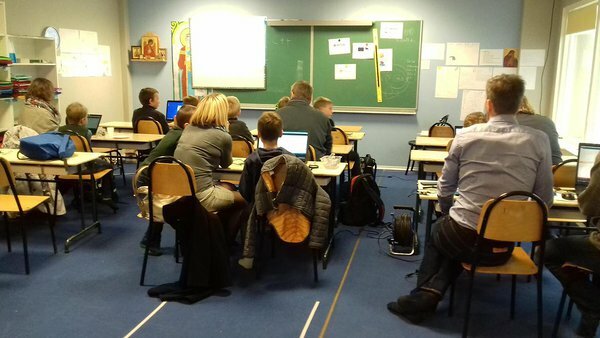 On 19th of October, children along with there parents gathered to participate in a workshop titled “Hello, Code!” at St John’s School in Tallinn. The participants were mostly 8- and 9-year-old boys and their fathers along with some mothers. The workshop was about programming an Arduino microcontroller. Arduino is a suitable platform for beginners. In studies, the platform can be used to teach robotics and programming, and it ties into the creation of electrical diagrams, connections between sensors and actuators, and whole systems design. “I thought a small independently running device is a more interesting way to teach about programming than a computer program. Arduino is a widespread and an affordable solution. In the past we’ve done several practical projects on Arduino, some of which I demonstrated at the end of the workshop,” said Workshop Instructor (and one of the parents) Peeter Rahuvarm. He has been teaching crafts at St John’s School and has also led a robotics club; he is currently planning to start an electronics club. He is currently a full-time employee of the National Library of Estonia and deals mainly with the technical side of web archiving. After the participants were seated and had turned on their computers, the workshop instructor supplied each desk with a microcontroller, some wiring, and a regular magnifying lens. The latter managed to surprise some of the participants; however, as they soon found out, it had its purpose. Namely, the details and numbers of microcontrollers are tiny, and a magnifier helps to see and identify them precisely. The instructor then explained the activities of the workshop and introduced Arduino Nano and its programming to the participants. “The program will do exactly as told. If even a single full stop has been misplaced in the code, the program will not work as you’d expect,” said Peeter Rahuvarm. The workshop continued with a code writing task; the code was supposed to sequentially light up green, amber and red lights on the microcontroller. All the means of programming a working traffic light were present and the participants were successful in doing so. Although most of the children present had no previous code writing experience, it was remarkable how quickly they grasped the concepts and understood the basics of coding. The issues were mainly technical: a dying laptop battery, a missing wire, etc. every child may not be familiar with the keyboard, and the instructor would likely not have enough time to assist everyone; we also hoped that parents would themselves become interested in the subject and continue programming with their child in the future. Programming develops attentiveness, the ability to see both the details and the whole picture, algorithmic thinking, and perhaps also self-expression - the ability to let a computer know what you want in a manner which the computer can comprehend. There are similarities with music - everyone should have a chance to try it as everyone will benefit. However, not everybody will enjoy programming (or playing an instrument), and the number of those with the potential of becoming great programmers is not that high,” said Peeter Rahuvarm. Code Week 2017 was held for the fifth time this year and can be considered a success in Estonia as 216 events were held. The Facebook page of the programming week gives an idea of the diversity of workshops: an introduction to virtual reality at Gustav Adolf Grammar School and Rapla Secondary School, a Practice Makes Perfect workshop on internet safety at Tabivere School, Frog Racing a.k.a. Lego WeDo robot sets at several kindergartens of Tallinn such as Kullatera daycare, a family day Mushrooming with Robots (BeeBots) at Tilsi Muumioru kindergarten, construction of a Micro:bit robot at Tallinna Südalinna School, etc. This time around several vocational schools also joined in and held workshops, with Ida-Virumaa Vocational Education Centre being particularly active.